People who have minus number glasses more than 6 diopter in power are said to have high or pathologic myopia. The glass number of such patients may even be as high as 15 to 20 diopters. The eyeball in such cases is enlarged leading to thinned out coats of the eyeball so the central area may be very weak (chorioretinal degeneration) leading to poor vision. The retina in these eyes is weak in the periphery also and usually has some degeneration, atrophic holes, or even retinal tears. These retinal holes or tears may sometimes lead to a serious condition of retinal detachment, leading to sudden loss of vision, and may require major surgery urgently to settle the retina. So a regular retinal checkup is very essential in these patients to look for the holes and to treat them with laser or else they might lead to a retinal detachment, which needs surgery. Also, whenever the patient with high number develops symptoms like flashes or floaters, he/she must immediately get the eyes examined to look for retinal hole, tear or retinal detachment. 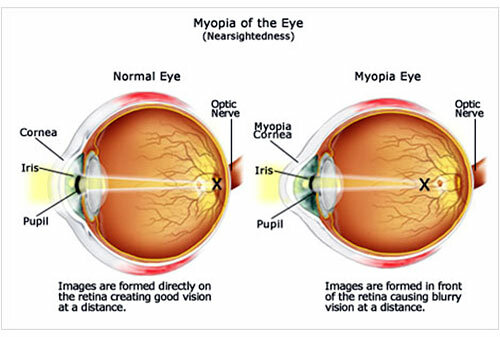 High myopia are also predisposed to develop abnormal new vessels in the central area (macula) called Choroidal Neovascular Membrane (CNVM), which leads to sudden marked fall in vision due to hemorrhage or fluid leakage. The treatment modalities being tried out for myopic CNVM are anti-VEGF agents like Lucentis, Avastin and Macugen, photodynamic therapy (PDT) with verteporfin, Transpupillary Thermo Therapy (TTT) laser and surgical options like macular translocation.